If you have clients who will be buying a new home in the next few months or over the next two years, then you need to know about the 2% BC Transition Tax. "These transition rules are part of a comprehensive package designed to provide equity for buyers of newly built homes and clarity and certainty for the construction industry – an important job creator in our province." It is a new tax that comes into effect on April 1, 2013. It will apply to the sale of new residential homes that are 10% or more complete as of April 1, 2013. The 2% BC Transition Tax will end on March 31, 2015. The 2% BC Transition Tax applies to the full price of a new home, which is 10% of more complete, where ownership or possession is on or after April 1, 2013, but before April 1, 2015. 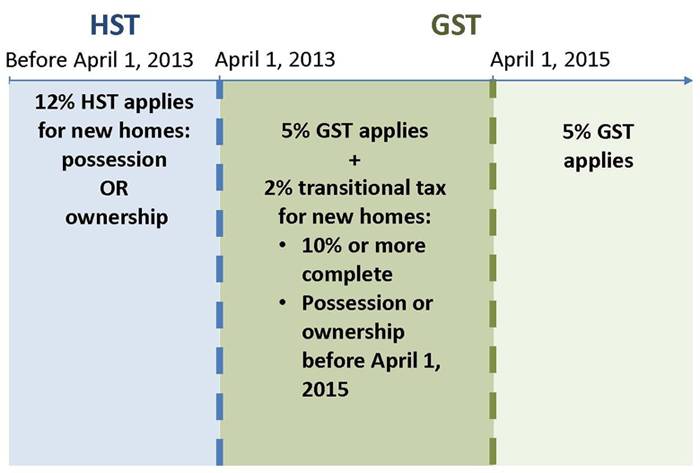 The 5% GST also applies to the full price of a new home, where ownership or possession is on or after April 1, 2013. With the end of the HST and the return to the PST/GST system, the BC government chose to introduce the 2% BC Transition Tax as a way, in their words, “to ensure the equitable application of tax for purchasers of new residential homes currently under the HST system” and after April 1, 2013 when the province returns to GST on new residential homes. The government also wishes to replace some of the revenue lost through the return to the PST. BC’s portion of the HST will no longer apply to newly built homes where construction begins on or after April 1, 2013. Builders will once again pay 7% PST on their building materials (construction inputs). The provincial government asserts that on average, about 2% of the home’s final price is embedded PST that builders pay on their building materials. Construction or substantial renovation is at least 10%, but not more than 90%, complete before April 1, 2013. For more information view the Board’s Fact Sheet: Information about the HST/PST New Housing Transition Rules. If you have questions, call Harriet Permut, Manager, Government Relations at 604.730.3029.